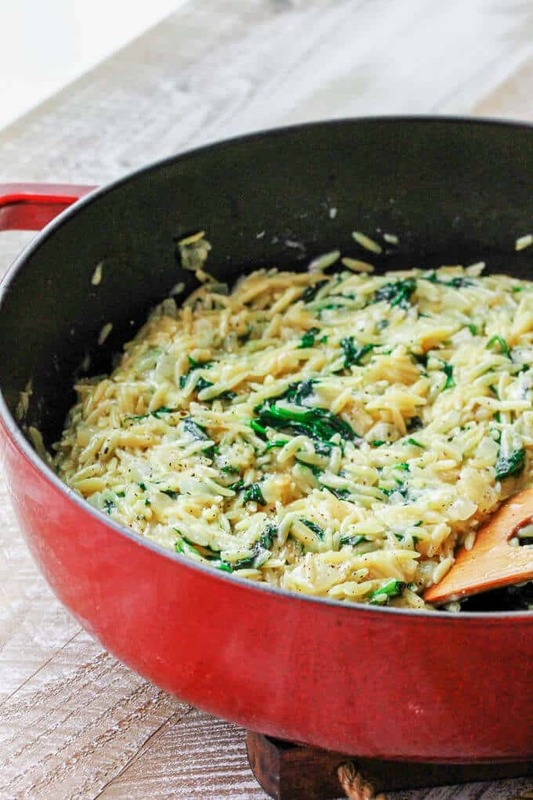 Parmesan Spinach Orzo is my newest obsession. 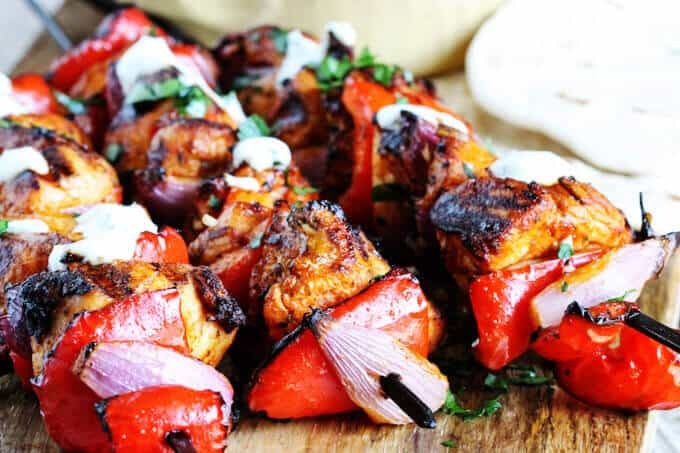 It’s so easy to make and it’s packed with flavor. I literally think that whomever invented Parmesan Cheese was an absolute genius. And then whomever decided to pair it with pasta managed to elevate the genius game. It’s just tastes so amazing! The cheese sticks to the pasta creating a nice, nutty, coating on each individual pasta piece. 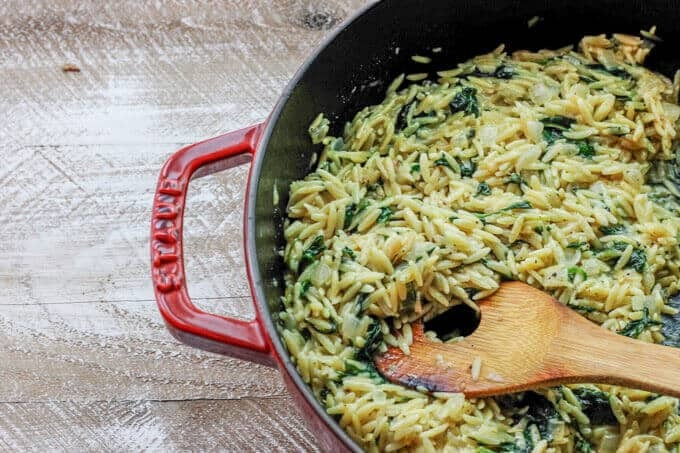 The addition of spinach, onion and black pepper adds depth and complexity to the tastes in this simple Parmesan Spinach Orzo dish. We’ve eaten this few times within the past week. I just couldn’t help myself. One of those times I demoed it was when we had guests over and (go figure) they loved it. 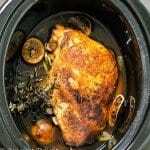 We devoured it, and then the next day I needed to cook another batch to satisfy my husbands insatiable craving. I know, I’m kinda blaming him for this repeat, but admittedly I wanted it as much as he did. Do I really need to say more? 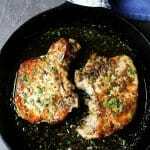 Finally, add salt and fresh pepper and your quick and easy side dish is ready. 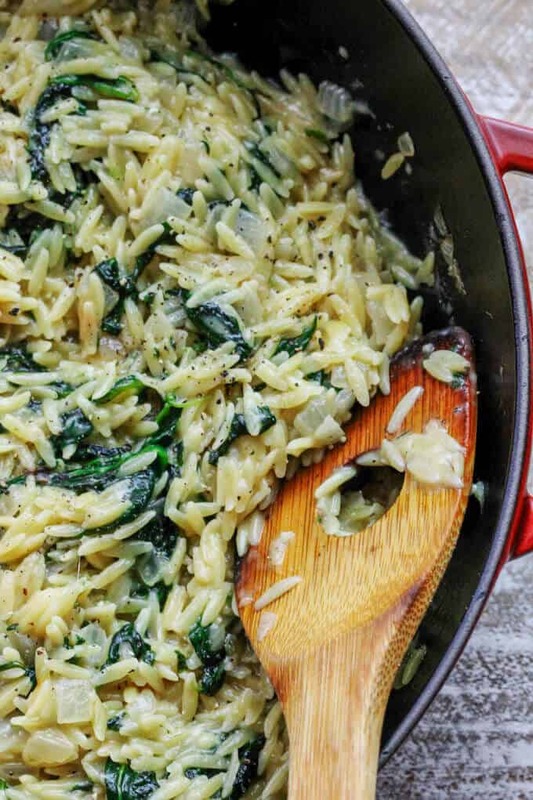 It takes 15 minutes from start to finish to cook this Parmesan Spinach Orzo dish. The pasta is so small that it literally cooks in about 8 minutes. 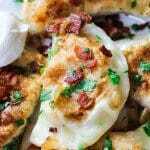 This is a perfect side dish for a busy weeknight meal. I would say that probably the hardest work you’ll have here is chopping the onions. I know some people may not like doing it, but the onions really add an extra aromatic in this dish. Cooked onions are sweet and they compliment the parmesan perfectly here. But if you really want to skip the onion, the omission wouldn’t spoil the dish. Parmesan and black pepper will pull up the slack; like in these two amazing dishes: Cacio e Pepe Zucchini Noodles and Parmesan Crusted Zucchini with lemon zest, thyme and pepper. 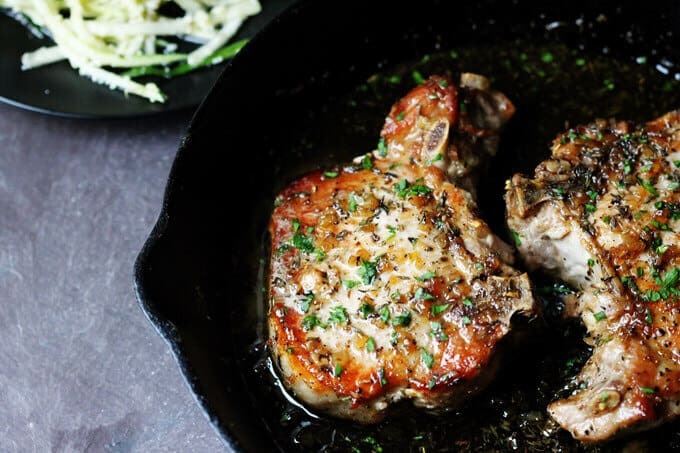 So if you’re looking for a quick and easy side dish that can pair beautiful with most meats, look no further. 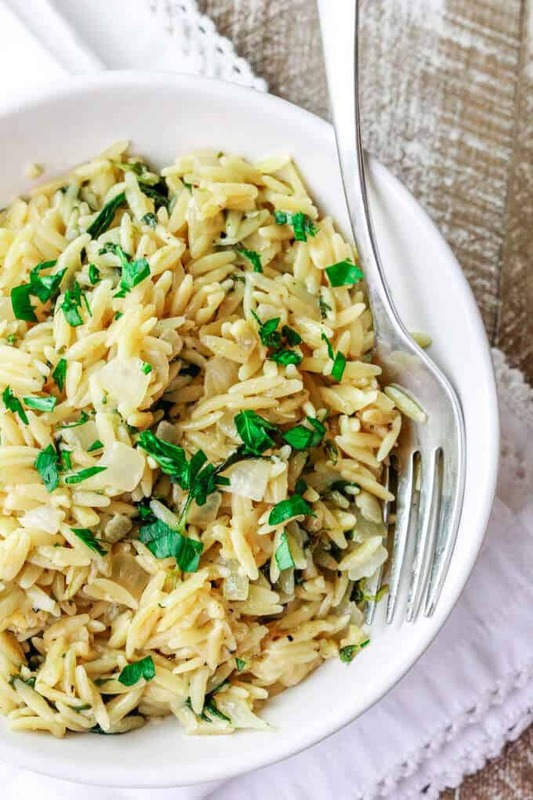 This Parmesan Spinach Orzo will be your next best thing to make and to eat. Enjoy! BTW I found information on Parmesan Cheese (Parmigiana Reggiano) on Wikipedia very interesting. 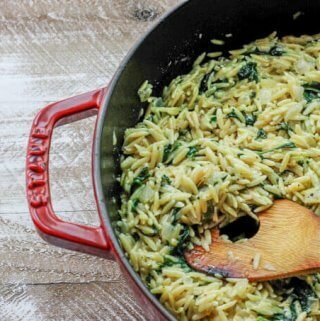 Parmesan Spinach Orzo can serve as a super quick and flavorful side dish, or a vegetarian entree. 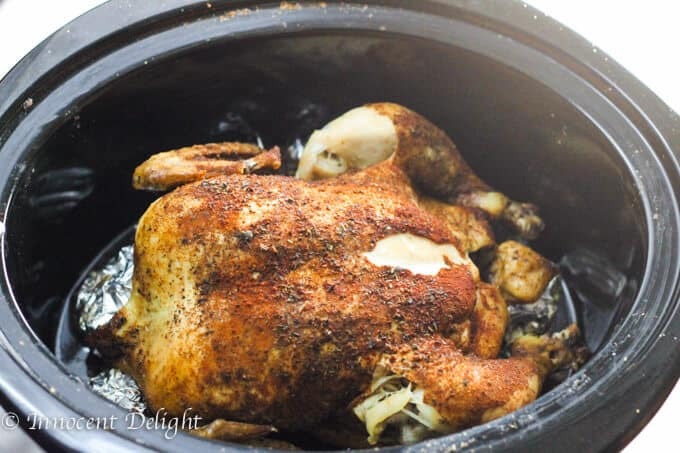 It contains only 4 ingredients and it's ready in 15 minutes. 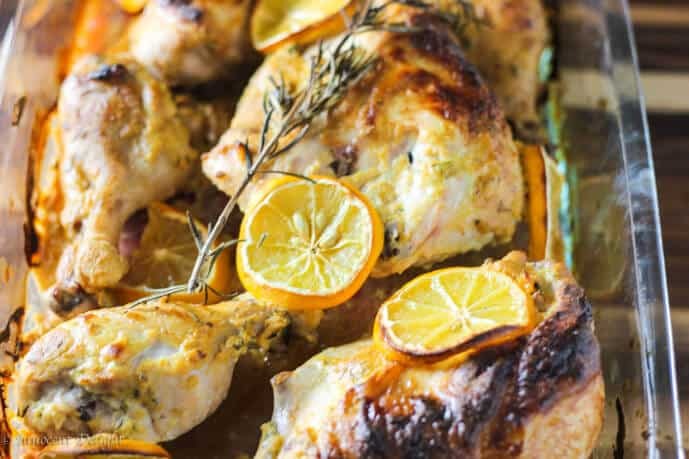 This is a perfect recipe for a busy weeknight dinner. This looks fantastic! 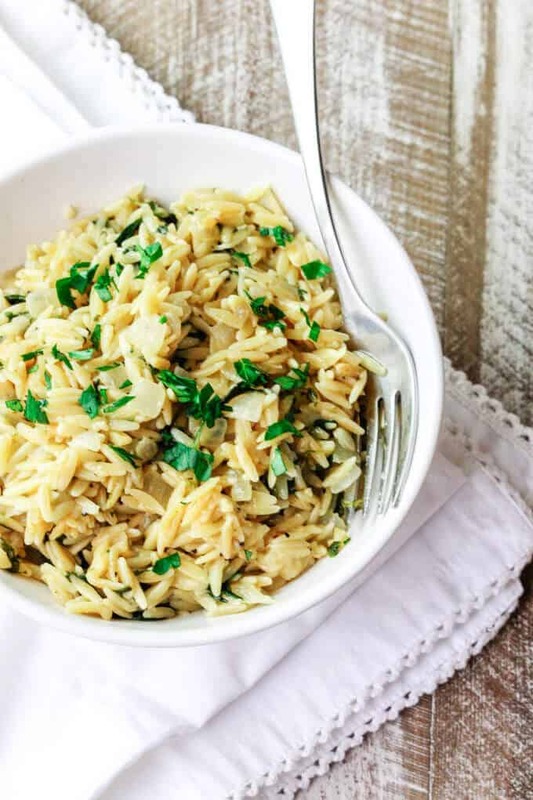 My husband loves orzo, and I love incorporating some spinach to help us eat more greens. Adding this to the menu ASAP! Yum!! Looks like a perfect side dish, gonna pin this for later!! With spinach and parmesan, it has to be delicious! I can’t wait to try it! So super easy! I bet this taste great alongside nearly everything! YUM! I always have orzo on hand! This is a great way to use it! So yummy, looks like our Kenyan chips.